I can’t believe it’s been a full year we’ve had in Vancouver! I’m not going have a rant here, just a quick share on gratefulness. I’m grateful for the gracious people who have shared with us in this beautiful city and the friends who have embraced us. 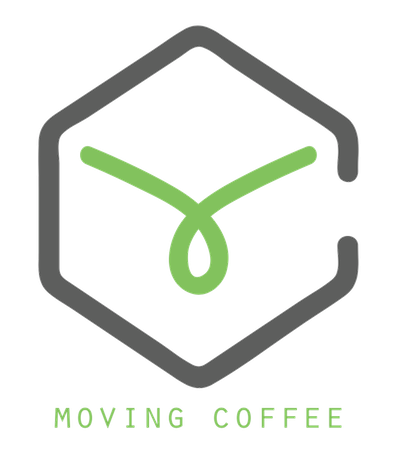 On the exterior, it can be hard to break in to Vancouver, but when I really think about it we have experienced so much and gotten to know many of you friends – coffee friends. Vancouverites. - "from they, to we"
It’s gone from “they” are like this, or they have tendencies to stick to their groups to “we”. If we want to see things improve, or friends we want to make, it doesn't help to stick on the outside but instead take ownership of being part of the community of Vancouver. A part of me has taken-on the identity and this is a great place to be. The friends will form around whatever your passions are. The answer is here, the obvious reason is it’s a cold drink in the summer months. Get your caffeine and still enjoy coffee. That’s the easy answer, but according to a recent RE:CO lecture, market analysis says that consumers treat cold brew very differently than coffee. They drink it in the morning (just like coffee), and they continue to drink it later on into the afternoon and evening hours. All terminology of retail food ‘categories’ aside, this is a chance for people who might pass coffee by, to taste it and be interested. The counter argument is that it doesn’t taste as nice and highlight the flavours of the origin of a coffee or the body. Where specialty coffee exists is to showcase origin and bring the best to the customer, to highlight the quality standards we 'expect' from farmers, and to tell people about that. Some may argue cold brew doesn’t do that, nor taste nice and therefore, we shouldn’t do it. Afterall isn’t that how every specialty cafe got out of doing hazelnut syrups? - We stopped apologising. Contrary to the previous statement, cold brew, in general does not adulterate coffee with flavour additives and sweetening agents. I think the positives are that you can have a conversation about coffee and create curiosity without being standoff-ish. Most definitely we could interest more people in the story of coffee that might have otherwise passed us by. In my mind, that is a positive. However, I am fully aware that you are entitled to your own opinion. Speciality coffee has gotten to where it is by being unapologetically dedicated to quality and that has achieved us a great spot in the market but it’s also good to grow the market as a whole. OK, obviously I’m feeling ranty today. We had some bitchin’ brews late last month. The intention was to have a laid back summer hang out; lawn chairs, beach towels, scenery, scent of sea and subconsciously make it totally about coffee. Well we had just that. One realization in the process is how much we complain about coffee industry in our city being competitive and un-engaging. But this was our first attempt at putting it to industry and asking for their support and it was overwhelming! We had loads of cold brew offered for tasting and it suddenly made us realize just how much selection we have in this town. “Wow, I wish we had that in Calgary” that’s when I realized – wait, we are really lucky! As a tribute we to our friends 'Vancouver Coffee Snob' who wrote the 10-best list of cold brews, see how many of these we tasted ;). 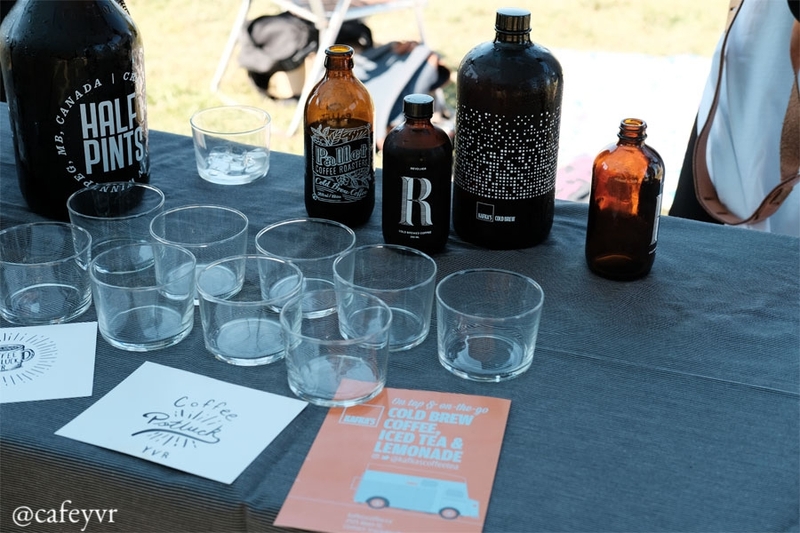 The benefit of tasting the different cold brews side-by-side was appreciating the selection of bean or origin and secondly seeing the effect of different processes on the final product. From the way coffee is brewed, temperature and time, is it in a vat or a tower, how it’s filtered, and how it’s bottled or nitro. There was a great variance of flavours! Here’s the list of thanks people we need to thank! 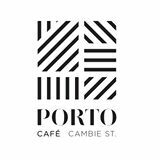 And a huge thank you to Porto Café who came out personally with a bottle of cold brew. Come talk to us personally (this Sunday, 11th of September at the next potluck) to get the low down on favourites. Did you like this post? Share it with friends on facebook and the social medias!